Tribune said in a statement Thursday that it has terminated its merger agreement with Sinclair, scuttling a $3.9 billion deal that would have given the broadcasting group an even broader reach into American living rooms. It's also suing Sinclair for breach of contract. The breakup of the deal is a stinging defeat for Sinclair (SBGI), owner of dozens of local television stations. Sinclair has been scrutinized for its ties to the Trump administration. Tribune (TRCO) had been expected to walk away after the deal came under scrutiny from US regulators. The FCC in July referred the merger to an administrative judge hearing, often a death knell for these types of deals. The commissioners called into question whether some of Sinclair's proposed divestments were a "sham" because they were being sold to people so closely aligned with Sinclair and in agreements that would still allow Sinclair to operate the stations. Wednesday was the first day Tribune was allowed to pull out of the deal, per the merger agreement. That's when Tribune board voted to walk away. Not only is it pulling out of the deal, but Tribune is suing Sinclair, arguing Sinclair's negotiations with the US Justice Department and FCC were "unnecessarily aggressive." Sinclair also refused to sell certain stations that would have helped the deal secure regulatory approval, Tribune claimed in a news release. "Our merger cannot be completed within an acceptable timeframe, if ever," Tribune CEO Peter Kern said in a statement. The lawsuit, filed in Delaware Chancery Court on Thursday morning, uses similarly tough language regarding Sinclair and seeks damages "including but not limited to approximately $1 billion of lost premium to Tribune's stockholders and additional damages in an amount to be proven at trial." Sinclair "repeatedly and willfully breached its contractual obligations in spectacular fashion," the lawsuit alleges, saying that government regulators laid out a "clear path" that Sinclair ignored. "In an effort to maintain control over stations it was obligated to sell if advisable to obtain regulatory clearance, Sinclair engaged in belligerent and unnecessarily protracted negations with DOJ and the FCC over regulator requirements... all in the service of Sinclair's self-interest and in derogation of its contractual obligations," the suit alleges. 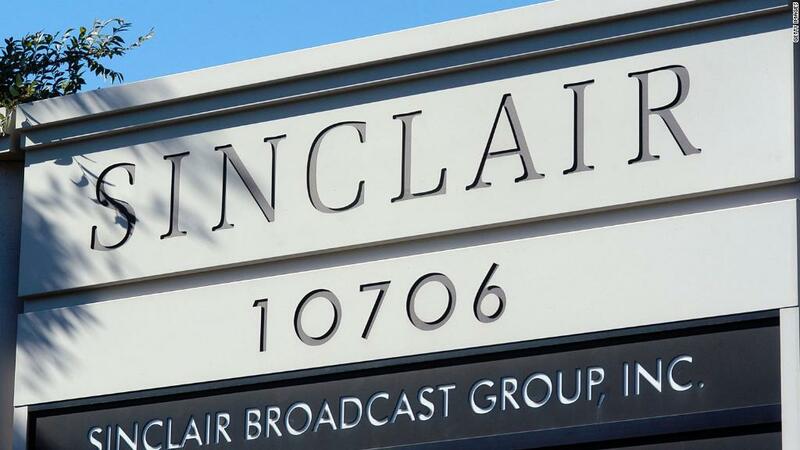 Tribune said in the lawsuit that the merger agreement included a clause that when seeking to divest stations, Sinclair would sell in a manner that would avoid "even the threat" of any regulatory review. But Sinclair, the lawsuit alleges, went so far as to invite legal action from the Justice Department, which was also reviewing the deal, going "so far as to threaten to file its own lawsuit against DOJ." The lawsuit also alleges that Sinclair was "confrontational with and belittling of DOJ staff" including DOJ antitrust chief Makan Delrahim. In a statement issued Thursday afternoon, Sinclair CEO Chris Ripley said the company was "disappointed" that the acquisition failed. "We unequivocally stand by our position that we did not mislead the FCC with respect to the transaction or act in any way other than with complete candor and transparency," Ripley said. "As Tribune, however commented, in their belief, the FCC's recent designation of the deal for a hearing in front of an Administrative Law Judge would have resulted in a potentially long and burdensome process and, therefore, pursuing the transaction was not in the best interest of their company and shareholders." "As for Tribune's lawsuit, we fully complied with our obligations under the merger agreement and tirelessly worked to close this transaction. The lawsuit described in Tribune's public filings today is entirely without merit, and we intend to defend against it vigorously," Ripley said. Tribune employees were notified that the deal was off in a lengthy early-morning memo from Kern that blasted Sinclair and said Tribune had done "everything it was supposed to do." Kern acknowledged that there would be "speculation" about who might buy Tribune, but urged employees to "shake off the cobwebs of deal distraction, ignore the outside noise, and continue delivering on our commitment to each other, to our customers, to our partners and to the communities we serve." Analysts expect Tribune to seek another buyer. A high ranking source inside Sinclair suggested to CNN one of those buyers could be Rupert Murdoch's Fox. Disney will buy most of 21st Century Fox (FOX), but Murdoch will still control Fox's broadcast, sports and news networks.